Are you looking for an exciting opportunity to serve your community? Are you interested in providing direction and oversight for an innovative program in health care? 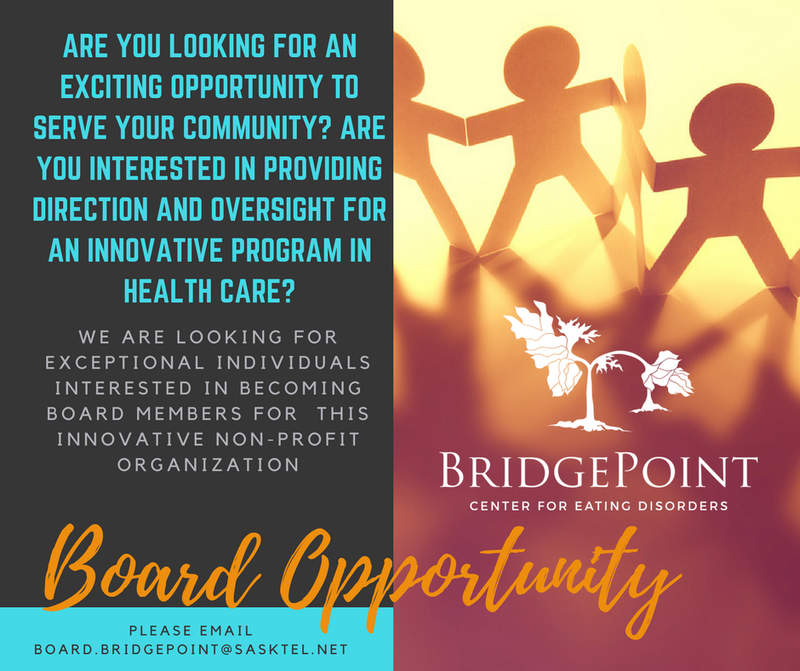 The BridgePoint Centre for Eating Disorders is looking for exceptional individuals interested in becoming Board Members for this innovative non-profit organization. Located in Milden, Saskatchewan, BridgePoint is a provincially funded and approved residential program that supports the recovery of individuals with disordered eating. The retreat atmosphere offers peace, quiet, privacy and simplicity. Services are available to women, men, adolescents and their families. The program provides a team-based approach with an emphasis on a group learning experience in a safe, comfortable and nurturing environment. The Board uses a policy based governance approach to provide oversight and direction for this program. If you are interested in finding out more or would like to submit a letter indicating your interest please email board.bridgepoint@sasktel.net. Anne was born and raised at Nokomis, Saskatchewan, the eldest child of a farming family. In 1974, she graduated from the U of S with a Bachelor of Nursing degree. Anne had several varied nursing positions, including care provider and educator before marrying and settling in the Milden area. She became the Director of Nursing at Dinsmore in 1980 and remained in that role until 2006. At present, she works part time at the Dinsmore Health Care Center. Anne has seen many changes in the health delivery system, including changes in the services offered, changes in Board structure and governance, changes in facility management, and changes in consumer expectations. During her career, she had the opportunity to participate on several provincial committees, as well as in the expansion of Dinsmore Union Hospital into an integrated facility and then further evolution into a Health Center. A love of nursing has persisted, along with enjoying the rural lifestyle, and love and admiration for her two sons. Karen has worked for 30 years in the health and social service sector in Saskatchewan, Canada and internationally. She held leadership roles with Saskatchewan Health, the Saskatchewan Commission on Medicare, and with the National Primary Health care Awareness Strategy. Karen has international experience supporting the development of health policy in health promotion, primary health care, health human resource planning, youth policy, mental health and alcohol and drug issues. She currently serves on the boards of the Canadian Mental Health Association, Saskatchewan Division and the Regina Exhibition Association as well. Karen has been involved with the development of the BridgePoint program since its beginnings and has always been impressed by the commitment of the staff and Board. She currently lives in Regina, is married and the mother of two children and the grandmother of three wonderful grandchildren. I have worked in the Human Services/Mental Health field for 48 years. I have worked as a Registered Psychiatric Nurse since 1971 and as a Registered Social Worker since 1986. These are skills and experiences that I still have although I have let the registrations lapse due to working at a part-time capacity. During this time, I have worked with a great variety of clients including: intellectual/cognitive disabilities, child and family counseling, Autism, and other types of mental health/illness issues. I have been a strong advocate for empowering the lives of persons with psychological and other disabilities and have served on a great variety of mental health, addictions, cross-disability, and other government appointed advisory groups. Currently, some of the groups that I am a part of include: Member of the Health and Addictions Action Plan Reference Group, Co-Chair of the PIAT (Program Implementation Advisory Team for the SAID program), and Member of the Steering Committee for the Severe Violent Offenders Response (SVOR) Program. I understand that eating disorders can be a serious mental health issue and would like to contribute to, learn about, and help those with this issue by serving on the BridgePoint Board of Directors. Marie lives in Milden, SK and has been on the Board since 2000. Her interest in disordered eating began during her involvement in the education field. Sharon was born in Alberta, and moved around Canada and the United States with her military family, which inspired Sharon to serve as well for 7 years. Sharon graduated from U of R with a Poli Sci/Econ degree and is still trying to finish her MA. Sharon worked in the Health field for 17 years and in Agriculture for 3. Currently serving as Chair of the board of Canadian Mental Health Association SK Division, Sharon has a long standing interest in mental health and wellness and increased funding to provide the services Saskatchewan residents require. Amy is a Registered Dietitian primarily supporting those who struggle with disordered eating and eating disorders. She entered university in 2005 and graduated from the University of Saskatchewan Nutrition Program in 2011. Amy currently work at the University Saskatchewan's Student Wellness Center. She has worked in areas of indigenous care, public health, community programming, and private practice. She worked as a team member at BridgePoint for just over one year from 2017-18. She have been a member of the Saskatoon Weight Attitudes and Disordered Eating (SWADE) since 2012, a committee working to assist professionals, individuals, families and the general public in the prevention and treatment of disordered eating. Additionally, she have been a member of the Student Wellness Center’s Eating Disorder Treatment Team since 2012. Amy works with many diverse individuals and groups within the university campus and broader community. She practices from the perspective that people are the experts in their life, and she is there to guide where needed. She learns and grows every day while working with clients, colleagues, and mentors. Amy currently lives in Saskatoon with her husband, Jevin, and puppy, Oliver. Kayla Seipp, CPA, CA is an Assurance Senior Manager with MNP, a public accounting firm in Saskatoon. Kayla is part of a team managing audit related services as well as the provision of assurance learning and development activities to the NorthSask region of the firm. Kayla has worked closely with her clients to deliver strong assurance solutions that help them meet their regulatory, governance and compliance requirements. Specializing in audit services for not-for-profit organizations, Kayla has assisted a wide range of charitable, not-for-profit and First Nation organizations, as well as other private companies, by delivering relevant, reliable and independently reviewed financial information to help them make strategic decisions about the future. Kayla obtained her Bachelor of Commerce degree with great distinction from the University of Saskatchewan in 2009, and her CA designation in 2011. She is a member of the Institute of Chartered Professional Accountants of Saskatchewan, as well as a member of the Audit Committee of the Saskatoon Community Foundation and the Non-profit Working Group recently established by CPA Saskatchewan.